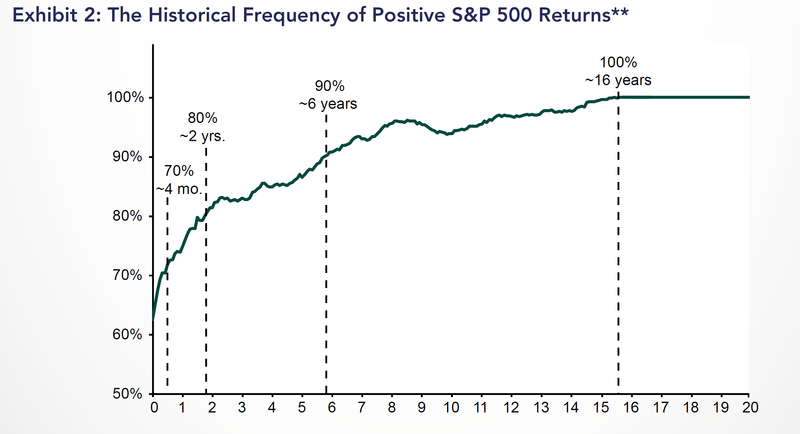 It shows the distribution of returns for the S&P 500 over time. The average return is around 10%, but that average can be deceiving. The individual outcomes rarely fall in the range of the average. They are spread all over the place. So when a market pundit predicts an 8% return next year, the odds of them being correct are incredibly small. And this is true regardless of what valuations are, what interest rates are, or how fast the economy is growing. 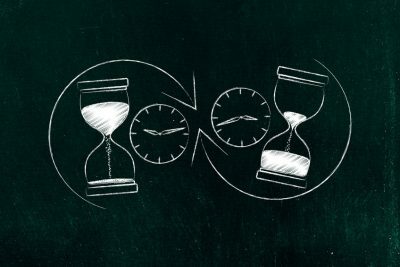 There is no evidence that any of those things can be used to accurately predict one-year market returns and base rates can help to show that. Base rates can also be great for understanding the range of possible outcomes for an investment strategy. For example, if I am investing in an index fund, it can be helpful to know how often I can expect to lose money over various time frames. The chart below from Fisher Investments shows how this can be done. As you can see, base rates will tell you that you can expect to lose money over a one-year period about 25%-30% of the time. Once your holding period gets up to 6 years, you will make money 90% of the time and once it gets to 16 years, there have been no historical periods where an investment in the S&P 500 has lost money. Understanding this information will help you understand what to expect over time. This is one of the best uses for base rates we have found in our asset management business. There is strong evidence that factor-based portfolios can beat the market over time, but the ride to get that outperformance is often a very rough one. Trying to explain that fact in advance, though, can be challenging. This is where base rates come in. Base rates can tell a potential investor how often a particular strategy has underperformed its benchmark over 1, 3, 5 and 10-year periods in its history. For a factor-based strategy, the one-year base rate could be something like 60%-70%. Over 3 years, it might be something like 80%-85%. But those numbers can vary substantially based on the investing approach being used, the size of the portfolio, and many other factors. Regardless of the exact numbers, the reason base rates can be very useful is that they help to quantify a risk that can normally be very ambiguous. It is one thing to tell an investor that a strategy will underperform at times. It is much better to quantify that and say that a strategy has historically underperformed in 35% of one-year periods, 20% of three-year periods and 10% of five-year periods. Providing that information up front helps to set realistic expectations and helps investors to stick with a strategy when the inevitable underperforming periods come. None of this is to suggest that the future will just be a repeat of the past. The market is smarter than all of us and will often do what you least expect it to. If you try to predict the future of the market with complete accuracy, you are going to be sorely disappointed. But if you are going to look at potential future outcomes, looking to the past for insights offers a much better opportunity for success than following market forecasts or the opinions of market pundits. When used properly, base rates can help to provide a better understanding of potential future outcomes and lead to better investing decisions.